This has been a week of words. I have had an eventful few days and the net result has been a rejuvenated love for reading and writing. As with several of my interests, this renewed enthusiasm has extended further than merely 'doing more of it'. Much further: this week I have been... ...writing my first fiction. Two short stories in development and ideas for more. I attended a writing workshop led by Australian author Cat Sparks, a hilarious, engaging and very open speaker. I loved listening to her talk and hearing her anecdotes; she also imparted many words of wisdom regarding the act and art of short story writing. My first efforts are arguably drivel but I thought it important to start writing as soon as possible (whilst I am full of enthusiasm and before I focus too much on her assertions that 'fiction pays appallingly' and 'you can't throw a rock these days without hitting a writer'). Of course, the moment I decide to sharpen my focus on my personal writing, my professional life goes into overdrive, too. But how very exciting it all is. Without wishing to bore you with the detail of my non-bloggy life, I am a writer. Given the last couple of posts, you would be forgiven for thinking I am a ballerina (more of which later), but no, I have an actual profession (until such time as I am accepted by the Royal School of Ballet, of course). Happily, the more I have to do, the more I feel able to do; the personal writing will not therefore take a back seat as I meet my professional commitments (Exhibit A being this week's blog post, Your Honour - wrote the career stuff at desk until 9pm then - still feeling lively/alive - began scribbling bloggy happenings in one of my myriad notebooks on the sofa. independent bookshop. Picked up Gone Girl by Gillian Flynn. All over the place at present, I decided to see what all the fuss was about. All the fuss was about a very good book. I might have preferred it had I not figured out the story before I bought it, but at least this relieved me of any whodunnit tension, allowing me to enjoy the construction and narrative instead. I don't envisage ever writing anything in the thriller vein and rarely read the genre either, but I do recommend Gone Girl. library. Borrowed The Night Circus by Erin Morgenstern. Recommended by a new friend and fellow writer, I am looking forward to starting this one. It will have to wait a little while, however, as I finished Gone Girl just this morning and am keen to immerse myself in Ms Jane Austen's world before getting involved in the business of nocturnal circuses. eBook. Pride and Prejudice. Now, classic literature has never screamed at me to read it. I am sure I am missing out as a result (and am on my way to fixing this) so please do feel free to leave me a comment if there is a classic (or more than one) than I should seek out before all others. For now, Pride and Prejudice is coming along very nicely. (Why have I never read this book? Why did it not scream at me?) It is sumptuous and I am mere pages into it. I love it. Silly me, ignoring classics for so long. No more. I have Jane Eyre already loaded onto my iPad ready for consumption. Please do steer me in the direction of more ridiculously-accomplished writing. I am very excited to think about the whole new world of literature opening up as a result of 'discovering' classic novels. Really, what a moron I am for not having at least tried this stuff in the past (I do not count obligatory reading of texts for the purpose of gaining a qualification as trying). I have just remembered that I have read To Kill a Mockingbird - both obligated and otherwise. I loved that book. Lose one moron point. 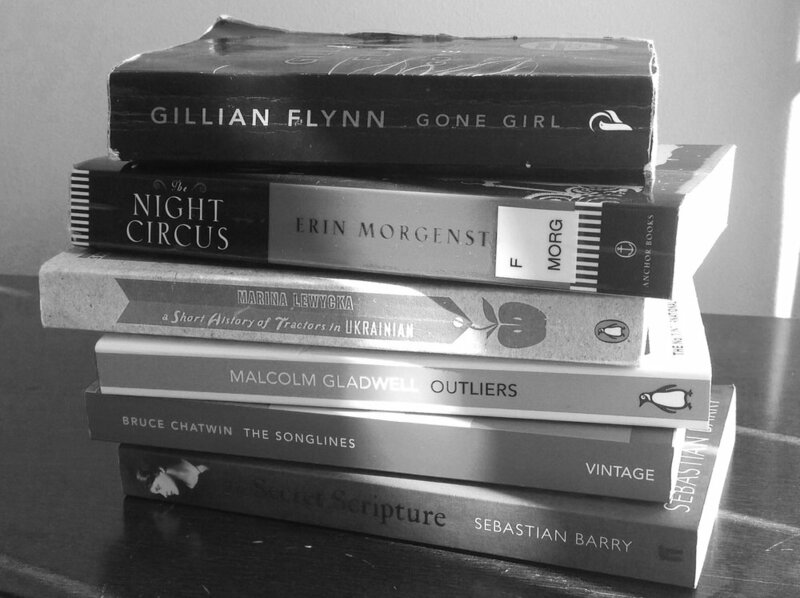 The Songlines (Bruce Chatwin) and Outliers (Malcolm Gladwell) are on my current to-read list too. I hope I don't have to quit ballet in order to fit in all this reading. No, I'll probably just sleep less instead - I was reading Gone Girl before 6am this morning as I was so keen to keep going with it. made another bara brith and actually ate some of it this time. Wow! This recipe does not use fat (no butter or oil) but manages to be exceedingly succulent thanks to the soaked fruit. I'll have to point you in the direction of Pass The Mixing Bowl again - it is simple to make (really), looks delicious and tastes much better than silly fruit cake - clearly worth a try. attended more Xtend Barre (ballet exercise) classes. Am seeing a difference and feel inclined to continue with this evil workout. had a Zumba class (missed this evening's - writing, writing, writing). I have been spoiled by an incredibly talented and personality-saturated instructor in the past; it is hard to imagine anyone being able to top that experience, but I live in hope if not expectation. attended a literary luncheon for women writers. Listened to a very graceful author, Gabrielle Lord, speak and read an extract from her new novel (due out in September!). had a lady brew up two different types of tea for me in cool tea shop (yes, such a thing exists) T2, then ended up buying exactly the same blend as last time. bought a rolling pin. Gingerbread men, you are in my sights.